After a slow and careful 5.6 mile drive on a dirt road we arrived at the parking area for Lake Lila. On summer weekends it is likely one would see thirty or more vehicles parked here - on a Sunday in mid-June there were but a half dozen. Our plan was to spend two days exploring and camp out for one night. The dirt road continues past the parking area but is gated and only open to the general public for hiking purposes. From the parking area a carry trail leads 0.3 miles to a lovely sand beach - a great spot for a swim whether you are coming or going. 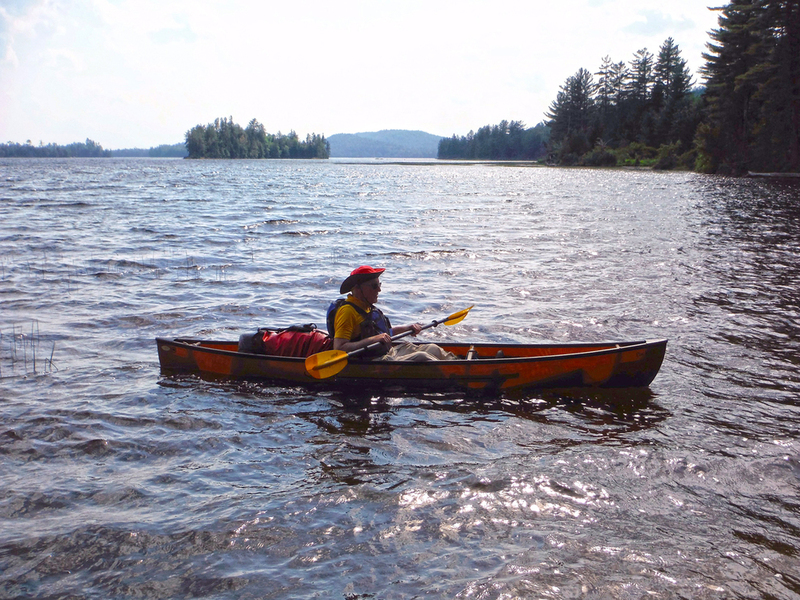 Having just a hair too much comfort gear (wilderness camping does not necessarily have to be “roughing it”) I make two trips to get canoe and gear to the water. 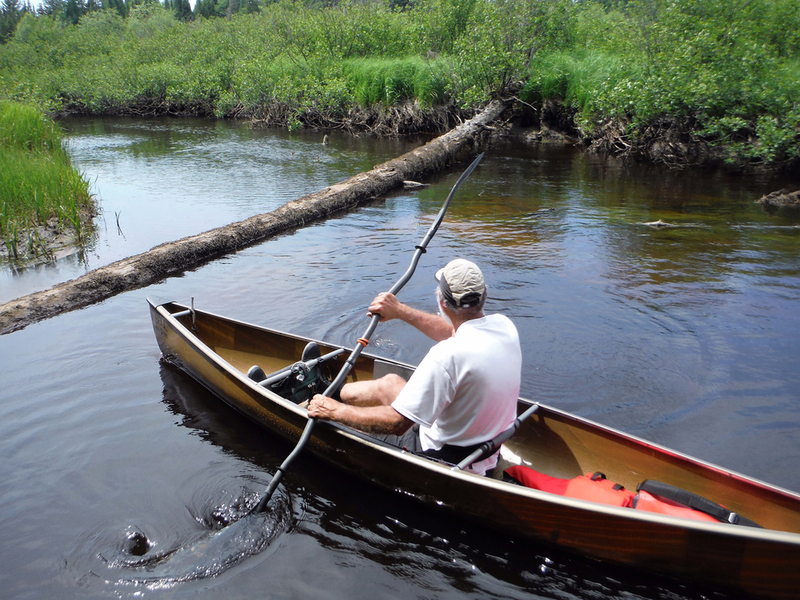 I find that the trail is bumpy enough that carrying the canoe using a yoke works best although some folks do use a cart and seem to manage. On a previous canoe camping trip here in early May of 2014 we experienced cold water, winds in excess of 20 mph, waves approaching two feet and woke up in the morning to a coating of snow on the ground; we paddled Shingle Shanty Brook while the wind was whipping the snow horizontally! That day “warmed up” to 40 degrees. In mid-June of 2016, on the last two days of spring, we again had to deal with gusty winds and two foot waves but at least the water temperature was closer to 70 degrees and the air was a toasty 80 degrees. It was not all wind and waves all the time - the afternoons were the windiest times but the mornings and evening were relatively calm. Lake Lila is in the William C. Whitney Wilderness and is the largest lake in the Forest Preserve totally surrounded by state land. Windswept white pines add a scenic touch to the shoreline and islands. 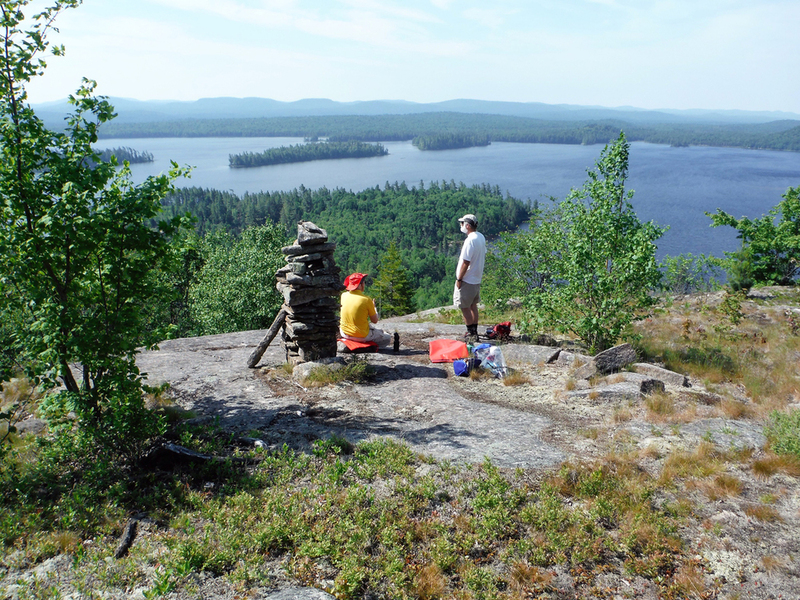 There are 24 designated campsites on the lake, four of which are on islands, plus a lean-to; some of the campsites are more desirable than others; all campsites have a fire-ring and many have a box privy (aka a “thunderbox”). We paddled two miles and found a nice campsite with a sandy beach and rocks out front - good for swimming and star-gazing. The pink flowers of sheep laurel decorated the edge of the forest. After setting up camp, we paddled up picturesque Shingle Shanty Brook which twisted back and forth between shores of grasses and alders for 2.7 miles until we reached the carry to Lilypad Pond - on the way we had to get out for one beaver dam and slid over at least three other beaver dams as well as a log. Upstream of this spot the stream is navigable for several miles but passes through private land. After a brief break on land sitting amongst a small field of flowering bunchberry we headed back downstream. Lots of dragonflies, damselflies and butterflies flitted about; a snake swam across the brook right in front of me and I spotted at least three bitterns. Back at camp, it was time for a swim and some relaxation. Overhead, an osprey seemed to enjoy playing with the wind. Later on I took a short evening paddle to view the rising of the full moon over the marsh of Shingle Shanty Brook and, in the opposite direction, the setting of the sun behind silhouetted pines. The day ended with the obligatory campfire (aka “caveman TV”). In the morning we paddled across the lake to campsite #5 then walked a short distance along a path behind the campsite, soon crossed the dirt road then bushwhacked northeast up an unnamed hill gaining over 400' in about 0.6 miles. Fires had swept the area between 1903 and 1908 and left open rock on some of the small mountains to the north of the lake. Just below the 2,136' summit there are great views from a large area of open rock - wilderness seemed to stretch out forever and we were in no rush to move on. Frederica Mountain is not far to the west and many visitors hike the 1.5 miles on dirt road and trail to a look-out below its summit. I believe the unnamed hill offers more views for less effort. Back at the lake the wind was really picking up with gusts to 30 mph. We abandoned plans to carry the 0.4 miles to Harrington Brook and paddle on to Rainer Brook. Instead we paddled counter-clockwise around the shore of the lake passing behind Canada Island and stopping to take a look at the old Nehasane Lodge site. The lodge was built by Dr. William Seward Webb, a railroad company executive; the lodge was removed in 1984 after the state purchased the land and this open grassy area is now growing in very slowly. Back on the water we passed to the right of Mosquito Island and saw a whitetail doe with two small fawns gamboling along a long stretch of sandy beach. We then proceeded downstream on the tree-lined Beaver River (much wider than Shingle Shanty Brook) for about a mile until we reached rocky rapids and private land. Returning back to camp and on the paddle out, wherever there was a good fetch over the lake, the waves rose to close to two feet. Over the two days we spent here we covered about 23 miles by paddle and by foot combined. Bad bugs were thankfully not too prevalent - just a few deer flies & mosquitoes. We also saw bald eagles and hawks. I often see and hear loons on many Adirondack lakes but, for me anyways, I haven't seen many on my trips to Lake Lila - we spotted just one on this trip. Regardless, Lake Lila makes for an awesome destination for the paddler willing to do a little work to get there. A visit of three or four days would be best for exploring everything the area has to offer. Rich Macha is owner of Adirondack Paddle‘n’Pole in Colonie NY, a store specializing in canoeing, kayaking and cross country skiing - for more trip reports visit the website at www.onewithwater.com.